The Format: (Directly from the judge’s post on HCrealms) 300 point Modern Age, no relics/resources/team bases/colossals. There are a couple of newbies showing up next Wednesday, so let’s try not to be too “Smashmouth” with our teams (EDITOR’S NOTE: At our venue, not constructing teams who are too “Smashmouth” is a somewhat odd yet surprisingly common build stipulation. Essentially, it means that you can’t use any characters who, in the comics upon which the figure is based, are powerful enough to walk on the actual sun, since, of course, “Walkin’ on the Sun” was the first hit single of the American Ska Punk band Smashmouth. This condition would preclude the inclusion of characters such as virtually any version of Superman, Hyperion, or even someone like, say, King Hyperion–hmm? What? Ooooooooooooooooooooooooooooooooooooooooohhhhhhhhhhhhhhhhhhhhhhhhhhhh… Wait are you sure? No, you’re right, that makes sense. I guess. Uh, gimme a second. I’ll be right back–). New Deathstroke! Now, with 100% more assassin-y goodness! Aww… generic theme means no theme probs for Black Widow to steal. Each of us made our three objects into a wall to hide behind in the center. We both move in to the center to start off the game. Deathstroke got the first shot off by doing a Running Shot from an object. He Perplexed the damage up to four, targeted Iron Man, and hit. That meant 4 damage went straight to… the generic S.H.I.E.L.D. agent! My opponent stopped to read the Agent’s card. Yep it worked like that. I had lost a 36 point character and Deathstroke was now double tokened in front of my team. Deadpool’s Sidestep wasn’t enough for him to get a shot in around Stealthy Black Widow. It was my turn. Outwit defense. Iron Man Hits for Deathstroke for four. A second Attack from Black Widow scores the KO. On His turn he was side step over enough to get a shot off on Iron Man. Iron Man is hit for 4 damage (takes two after Invuln). My team clears. On his turn Deadpool clears his own token via the trait. He attacks Iron Man, but missed due to a theme team Prob from the Widow. On my Turn Widow Hit for 3 (2 after toughness). Iron Man misses. On my opponents turn he heals one. Between some bad dice roles and another theme team prob, my opponent doesn’t get in any more damage this game. 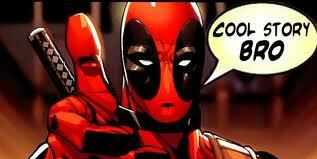 However it still ends up being a long game due to Deadpool’s 8 clicks and his healing ability. It probably took me at least 13 clicks of damage to get all the way through that 8 click dial because of all the healing. 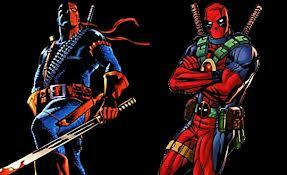 Deathstroke was the weak link here. That sounded weird saying that. 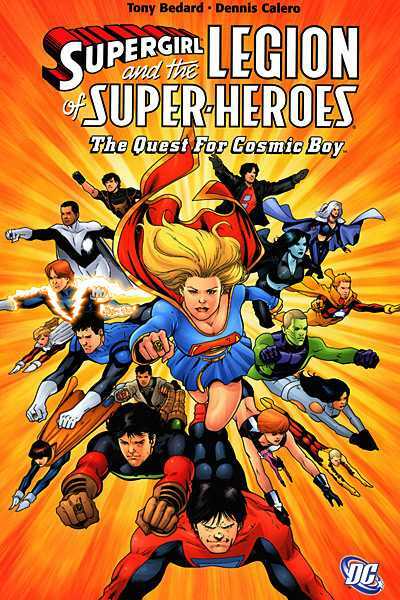 The Quest for Cosmic Boy? How about figuring out why space is suddenly ORANGE first?! To start off this battle I moved about a 3rd of the way up the map behind some blocking terrain. That was enough for my opponent to use his Cosmic Boy’s double TK to get the alpha strike on me. Supergirl hit Iron Man for four and it was all transferred to the CATWS005 S.H.I.E.L.D. Agent for a KO. Luckily Lightning Lad misses his attack. One my turn Iron Man outwits Lightning Lad’s defense and hit’s him for four. A follow up running shot from the Widow gets the KO on Lightning Lad. Both of my characters are pushed. The death of Lightning Lad untokens both of my opponent’s characters due to their ATA. Supergirl hits Black Widow for 4 with knock back despite a theme team prob and a shape change roll. Cosmic boy flies up to join her. On my turn Widow sidesteps out of range and I clear tokens. On his turn my opponent flies Cosmic Boy up to some elevated terrain and Then uses a free action TK to bring Supergirl next to him. On my turn Iron Man gets off a 4 damage hit (two after Invuln) with Knockback on Supergirl. Cosmic Boy removes actions tokens and Supergirl grabs an object and hides behind Blocking Terrain waiting for a chance to charge next turn. On my turn I remind my opponent that Iron Man shoots through Blocking Terrain. I outwit Super Girl’s defense and 4 damage scores a KO. 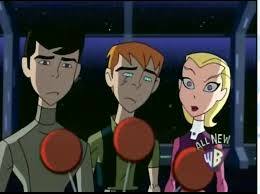 Black Widow attacks Cosmic Boy and misses. One my opponent’s turn he KOs Black Widow with an attack from Cosmic Boy. I clear Iron Man. He clears Cosmic Boy. I Outwit his defense and score a hit for 4. He misses. I finish off Cosmic boy with another hit for 4. My opponent is near the center of the map. I’m a third of the way up in hindering. No one has tokens on them. My opponent starts with a double TK. He sets up Saturn Girl with a clear line of fire to Iron Man. Lightning Lad has to use Running Shot. At this point my opponent stopped to consider whether he should use his Mind Control or Psychic Blast first. I was afraid he was going to Mind Control Iron Man and KO my Agent. Instead he did the Running Shot first doing three to the Agent via Mastermind. The Agent lost his Mastermind power, but was still alive on his last click. Then he used Mind Control on Iron Man. Iron Man did a close combat attack on Widow that hit for 4. On my turn I started by having Widow try to Incapacitate Lightning Lad. She missed. I had Iron Man Outwit his defense. The Agent used a power action from his TA to increase damage and combined that with his Enhancement to send Iron Man’s damage to 6! He shot at Lightning Lad and KOed him in one hit. Iron Man took a Mystics damage in the process. The next turn Saturn Girl KOed the Widow, but during her time alive Widow was able to use all three of my opponent’s theme Probs! We each needed some time to clear tokens. The next action was Saturn Girl using Psychic Blast on Iron Man for 2 damage. Iron Man used Perplex to up his defense and cleared. Saturn Girl pushed and missed. Iron Man rolled Regen and got a 6! Full Health! Saturn Girl cleared. The Agent was still alive and used Enhancement on Iron Man. Precision Strike ignored Saturn Girl’s Super Senses and it was another 1 hit KO. He took 1 Mystics damage in return. Next turn Cosmic Boy KOed the Agent while Iron Man had to clear. Cosmic Boy then hit Iron Man for 3 (2 damage after toughness). Iron Man was back on Regen. On my turn I tried Regen and rolled a 1 to get no health back. Cosmic Boy missed on his turn. I opted to not push to Regen. Cosmic Boy had to clear. I tried Regen again and got another 6! Cosmic Boy hit me for 1 damage (after Invuln). I hit him for 3 and took 1 back. He hit me for 2 more (after Toughness). I was back on Regen again, but this time I shot Cosmic boy instead of using Regen and that scored the KO. I originally thought it was a mistake not to use Mind Control to KO the Agent and then have that damage done to Iron Man instead, but the more I think about it – I think my opponent was right. 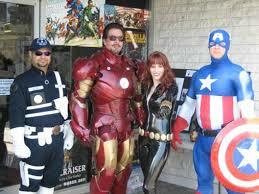 The stealthy Black Widow was far more dangerous to his team of three ranged attackers. IIM001AE Iron Man is a paper tiger. Great on offense, but his defense is poor for a character of his point range. I would hesitate to play him again without a CATWS005 S.H.I.E.L.D. Agent (or two) on my team. CATWS005 S.H.I.E.L.D. Agent was my M.V.P. He absorbed my opponent’s alpha strike every game for my higher value pieces. In the last game he only took 3 damage and his Enhancement and TA were letting him contribute even on his last click. I would use him again any time I was playing a Shield character over 75 points. CATWS003 Black Widow was good but not great. When she could steal theme probs she was great. Without that she was only good. Her attack value was low. Her ability to Outwit a stealthy figure is very good, but didn’t help me much this tournament. I would like to use her again to see if I can get better results. SLOSH001 Cosmic Boy is the real deal. His double TK all but guarantees you a double first strike. DP201 Deadpool was extremely tough, but his offense wasn’t great. My opponent kept getting stuck on clicks 3 and 4 that have a natural 2 damage showing. That’s not good on a 149 point character.